These words of Tony Blair's are revealing. His political life was always motivated by a profound sense of mission, which was fundamentally religious. Through encounters with the Australian Anglican priest at Oxford, Peter Thompson, Blair came to understand the history and continuing purpose of Christian socialism. His most important intellectual influence was the philosopher John MacMurray, whose writings Blair devoured. 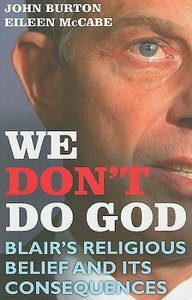 But it was through the author of this book, John Burton, that Blair came to understand the application of Christian socialist principles in action. The influence of his wife Cherie Booth's Catholicism also had a profound influence on Blair. Interviews with Cherie reveal her role in shaping his religious world view. Bill and Hilary Clinton are also shown to have played a formative role in Blair's ideological makeup. Blair's work in the Middle East may become the final and triumphant expression of his moral and religious principles. Many will find this hard to swallow in the light of Blair's actions in the Middle East whilst in office. Whatever viewpoint one takes on this complex moral issue, John Burton helps us to understand more deeply one of the most successful but enigmatic prime ministers of the post war years. About "We Don't Do God"
John Burton EdD works as a counselor in a private practice, teaches graduate school, and conducts workshops on various human relations and growth topics. He lives in Greenville, South Carolina. John Burton was Tony Blair's political agent for the entire duration of Blair's time as a Member of Parliament and was a formative influence on him.